The following are the stabilization products that are distributed and installed by ACF. Used to stabilize soft soil. Reduce subbase and reduce base in pavement section. High strength reinforcement for steep slopes, embankments, sink holes and modular retaining walls. Product Types: Woven geotextiles, high strength geotextiles, and geogrids. ACF offers the widest selection of woven geotextiles for this application. Geotextiles provide four important functions which enhance roadway performance, separation, stabilization, reinforcement and drainage. The geotextile you select depends on which functions are suited to your project. Both woven and nonwoven geotextiles provide long-term separation of the aggregate base from the subgrade soil. By separating these two materials, the geotextile maintains the original thickness of the roadway aggregate. This is the most important geotextile function for roads, particularly when constructing on weak to moderate strength subgrade soils (CBR < 7). The geotextile also makes it possible to use a more open-graded, high permeability pavement aggregate base which improves rapid drainage. By decreasing aggregate loss and increasing its permeability, you substantially increase roadway performance and life while decreasing maintenance costs. Higher strength woven and nonwoven geotextiles provide stabilization in addition to the primary function of separation. Through stabilization, a geotextile can increase the effective bearing capacity of low strength subgrade soils. 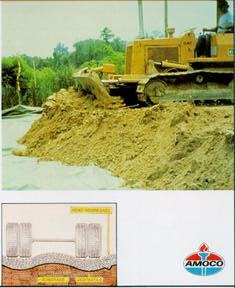 A stabilization geotextile reduces subgrade pumping, over-excavating and required aggregate thickness. Stabilization geotextiles substantially reduce construction costs for paved and unpaved roads. For example, unpaved road aggregate thickness can be reduced by as much as 30% to 50% when a stabilization geotextile is used. Separation, stabilization and reinforcement are needed for construction over weak subgrade soils (CBR < 2). High-modulus, woven reinforcement geotextiles provide an essential platform for building a competent roadway base and minimizing fill depth requirements. Amoco's nonwoven geotextiles and premium woven geotextiles provide the added benefit of subsurface drainage. These products are ideal when water is expected to flow from the subgrade soil into the aggregate base. Amoco offers a complete line of woven and nonwoven geotextiles to improve the performance of highways, unpaved roads, parking lots, airports, loading docks and storage areas. These fabrics are installed beneath thousands of miles of roadway each year. Because the product you select is dependent upon construction conditions, your local distributor can assist you in selecting the Amoco geotextile that is right for the job.